The subject of the book is the mathematical theory of the discontinuous Galerkin method (DGM), which is a relatively new technique for the numerical solution of partial differential equations. The book is concerned with the DGM developed for elliptic and parabolic equations and its applications to the numerical simulation of compressible flow. It deals with the theoretical as well as practical aspects of the DGM and treats the basic concepts and ideas of the DGM, as well as the latest significant findings and achievements in this area. 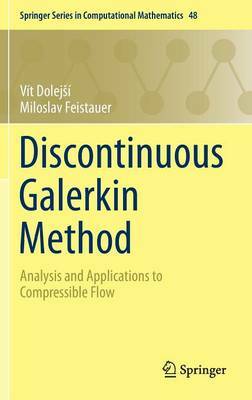 The main benefit for readers and the book's uniqueness lie in the fact that it is sufficiently detailed, extensive and mathematically precise, while at the same time providing a comprehensible guide through a wide spectrum of discontinuous Galerkin techniques and a survey of the latest efficient, accurate and robust discontinuous Galerkin schemes for the solution of compressible flow.